Modern Retro Over Ear Headphones Get professional quality sound from everyday headphones. These 'phones Look great anywhere you go and sound great for hours at a time. It features ultra-comfortable ear pads with a good amount of isolation to keep you focused on the task at hand. Enjoy clean robust sound across the audio spectrum. They are perfect for mobile devices, HiFi, and and audio/video production. Enjoy your favorite music in private or share it with your friends using these uniquely designed Bluetooth headphones. Like many other over-the-ear designs, these headphones feature a pair of 40mm drivers, which deliver a 20Hz ~ 20kHz frequency response and 113dB sensitivity. Where they differ from other designs is that they also sport a pair of speakers using a second pair of 40mm drivers. 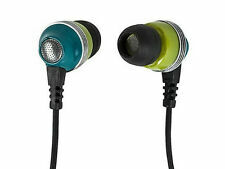 Simply flip a switch on the earpiece and the audio signal switches from the drivers inside the ear cup the external ones. No longer will you need to hand your headphones to someone else when you want to share a tune. Just flip the switch and you and everyone else in the room can share the experience!. The BT-200 Bluetooth Wireless Stereo Headphones feature the latest in Bluetooth technology, with hands-free convenience and superb sound quality. Roam wirelessly up to 32 feet away from your paired Bluetooth device and listen uninterrupted for up to 14 hours on a single battery charge. The stylish design, comfortable earpads, and up to 30 hours of playback time make these the perfect headphones for home, the office, or on the go!. 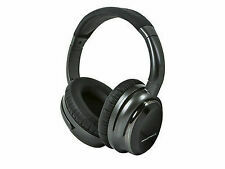 Monoprice Noise cancelling Headphones. Model 8323, Black, Missing one of the button covers. (see pic 3) 12 foot cord included. They are in very good condition with slight wear on the ear cushions and the cushions over the top of the head. 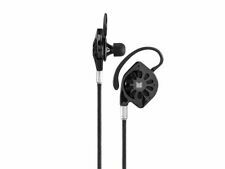 The Monoprice MP30 In-Ear Earphones deliver exceptional sonic fidelity and appearance. Utilizing beryllium drivers enclosed in a natural wood housing, the MP30 delivers exceptional clarity and sonic detail, with deep bass and a smooth midrange. Tuning nozzles allow you to tailor the sound to your liking go for accuracy or add a dash of extended bass response. Enjoy amazing musical clarity in a featherweight package using these Hi-Fi Lightweight On-Ear Headphones from Monoprice! Almost too good to be true! Check out a full product review by CNET here Rated "Best on-ear headphones for your budget" by Business Insider, check out the review here These on-ear headphones tip the scales at a mere 4.5 ounces, which helps prevent fatigue during long listening sessions. The inline controller contains a microphone for phone calls and allows you to pause/resume audio playback. With regards to the sound of the headphones I have had no issues with any variety of audio sources I have put through them. But I didn't really personally understand that general consensus until I actually started buying other, more expensive headphones. DJs can put in some long hours as they spin the tunes and they need equipment that is both comfortable and rugged enough to withstand heavy use. These Monoprice Pro Headphones are designed for the professional sound spinner and the casual listener that wants the best quality sound and best durability available. The earpieces on these 'phones are equipped with thick, comfortable padding that keeps the music inside and the noise outside. They swivel up to 90 degrees so they can double as a makeshift set of speakers. The headphones can extend up to 1.5" on each side and are wide enough to fit over a cap, while maintaining good contact over the ears. The headpiece is also padded on the inside and is made of flexible rubber, ensuring that it won't break. The headsets do not have a fixed wire. Premium 3.5mm Wired Earbuds Headphones with Mic for Apple and Android Devices Even better than that. Enjoy full-range sound from the 10mm drivers, with extended bass and good mids and highs. Enjoy the convenience of the in-line microphone and play/pause button. Don't worry, just because they are cheap doesn't mean they are cheap. The tangle-free flat cable will allow you to concentrate on what is important, the music. And the money you saved. monoprice active noise cancelling bluetooth headphones. Open box. US shipping only. With its stylish design, these Monoprice earphones will prompt complete strangers to ask you where you got them, but you won't hear a word they say as you rock on down the highway! Made with a noise-isolating design and producing clear and solid sound, these earphone are a great way to enjoy your favorite music from your iPod or other portable music device. 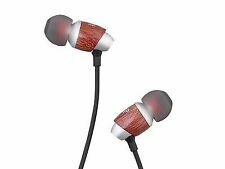 They fit comfortably into the ears and produce solid bass notes and clear midrange tones, both normally a weakness in earphones, thanks to the large 14.2 mm driver unit. The package includes three different sized pairs of silicone earbuds, for a better, more comfortable fit. 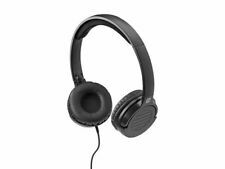 The Monoprice BT-300ANC Over Ear Active Noise Cancelling Headphones great everyday wireless headphones for use at home, at work, or while traveling. Featuring a foldable, extremely portable design, 40mm drivers, and active noise cancelling technology, the BT-300ANC utilizes Bluetooth wireless technology that can connect from up to 32 feet away. Experience exceptional sound quality, comfort, and design with the Monoprice BT-300 Over Ear Active Noise Cancelling Headphones. New Monoprice MST-870-2Y 8" In ceiling Speakers Pair. In either case, it's a win-win situation for those who desire high fidelity and those who put emphasis on decor. Featuring a removable and paintable grille. Get great audio reproduction plus the convenience of a microphone and in-line controls with this pair of Enhanced Bass Noise Isolating Earphones from Monoprice!These ported earphones feature a noise isolating design, which means you hear your music (or phone call) and not all the noise of the outside world. The low-end response is enhanced to provide a rich, full bass experience that transcends the 10mm driver size.In addition to outstanding sound quality, these earphones can function as a hands-free earphone/microphone for your cell or smart phone. An in-line control module gives you the ability to change volume, skip tracks, and answer incoming calls. The earphones come with 3 sets of earbuds, allowing you to customize the fit of the earphones for maximum comfort and audio quality.These. SonicSolice Active Noise Cancelling Bluetooth Over Ear Headphones, Champagne with Tan Incredible Full Range Sound: Connect to the SonicSolace headphones using Bluetooth, turn on the Active Noise Canceling feature and slip away to your happy place. Take comfort in your sound, maybe for just 30 minutes or maybe for an entire 8 hour flight. Choose from Classic Black or the elegant Champagne & Tan. Active Noise Cancelling: Immerse yourself in your own soothing aural oasis with fully active noise cancelling technology. The Monoprice BT-210 On Ear Bluetooth Headphones offer great sound, a lightweight design, and clear, natural audio across the entire sonic spectrum. A softly padded headband and plush, padded ear cushions stay comfortable, no matter how long your listening session lasts. Connect your headphones using the wireless Bluetooth radio or using traditional 3.5mm audio cable. Take phone calls with the push of the button and utilize the on ear controls to raise volume or skip tracks. The Monoprice BT-210 Bluetooth headphones are everyday, comfortable headphones that are perfect for the home or office. Monoprice 8323 MEP-839 Headband Headphones - Black. Shipped with USPS Retail Ground. Open box item comes with everything in picture. Monolith M560 Over Ear Planar Magnetic Headphones 56mm Driver Open/Closed Back. Fantastic sound quality!! Condition is New. Monoprice ANR : Premium noise-rejection technology. Full Sized Headband : Padded for maximum comfort. User Manual. Design and Materials : Strong, Comapct & durable for ultra portability & longer life. Note that use of the ANR function is optional; the earphones can be used without installing a battery or powering on the ANR module. When used without the ANR function, these earphone provide up to 22dB passive noise reduction. The Monoprice BT-510 On Ear Active Noise Cancelling Headphones are great everyday wireless headphones for use at home, at work, or while traveling. Featuring exceptional style and detail, 40mm drivers, and active noise cancelling technology, the BT-510 utilizes Bluetooth technology and can connect from up to 32 feet away. Experience exceptional sound quality, comfort, and design with the Monoprice BT-510 On Ear Active Noise Cancelling Headphones. The Monoprice MP80 In-Ear Earphones deliver extraordinary sonic fidelity in a stylish package. Utilizing balanced armatures and dynamic drivers enclosed in an aluminum housing, the MP80 delivers exceptional clarity and sonic detail, with deep bass and a smooth midrange. Tuning nozzles allow you to tailor the sound to your liking you can go for accuracy or add a dash of extended bass or treble response. Incredible Full Range Sound: Connect to the SonicSolace headphones using Bluetooth, turn on the Active Noise Canceling feature and slip away to your happy place. Take comfort in your sound, maybe for just 30 minutes or maybe for an entire 8 hour flight. The Monoprice Move is the perfect earphone for workouts and everyday use. Perfect for the gym, this wireless Bluetooth earphone hasbeen IPx7 waterproof rated and can connect to any device from up to 32 feet away. Phone calls will sound crystal clear thanks toQualcomm cVc 6.0 noise cancellation technology. Amazing battery life gives up to 8 hours of audio playback or 10 hours of talk timeon a single charge. Wirelessly stream your favorite music from your Bluetooth enabled mobile device to your home audio system using this Bluetooth Streaming Music Receiver from Monoprice! This Bluetooth receiver features both a 3.5mm analog stereo audio output and an S/PDIF (Toslink) Digital Optical Audio output, so you can connect it to virtually any home theater system or audio amplifier. It supports Near Field Communications (NFC), which allows you to pair your mobile device simply by placing it on the receiver. It also supports the Qualcomm aptX audio codec, for superior audio quality when streaming from an aptX-enabled device. The receiver measures just 2.8" x 3.0" x 0.8", so it is easy to install almost anywhere near your audio system. A 6 ft 3.5mm audio cable and a 3.5mm to 2x RCA cable adapter is. Over the Ear Pro Headphones. Hi-Fi DJ Style. 1 x Over-the-Ear Pro Headphones. 3.5 mm jack in the bottom of the left earpiece, which allows a standard 3.5 mm audio patch cable to be inserted. Designed for the professional sound spinner and the casual listener that wants the best quality sound and best durability available. The world is so full of noise that it can be difficult to find the quiet you need to concentrate or to enjoy your favorite music. When you need to block out the sounds of the world, you need a pair of Noise Cancelling Headphones from Monoprice!These headphones have been designed to provide superior noise cancellation, leaving a quiet, empty soundstage in which to experience your favorite music. Additionally, they can be used without any musical or audio content when what you need most of all is peace and quiet. The Active Noise Reduction circuity will eliminate almost all external sounds, giving you the quiet you need to think and concentrate.The ANR circuitry is powered by a single AAA battery (included), which can power it for up to 50 hours. The headphones can also be used in passive. The top-rated Monoprice 8323 headphone is now wireless! Roam wirelessly up to 32 feet away from your paired Bluetooth device and listen uninterrupted for up to 10 hours on a single battery charge. They feature the Qualcomm aptX audio codec, for superior audio quality when streaming from an aptX-enabled device. Designed for the professional sound spinner and the casual listener alike, they deliver the best quality sound and durability available. Three newly engineered drivers encased in a sleek and stylish aluminum housing are able to reproduce the entire sonic spectrum from your high resolution music collection with aplomb! From the quietest string instruments to the bombast of a rock concert, the Triple Driver earphones can reproduce the most challenging material with ease. An extended, high resolution frequency response, exceptional micro detail, midrange clarity, and tight bass deliver an amazing listening experience that will satisfy. These Monoprice Pro Headphones are designed for the professional sound spinner and the casual listener that wants the best quality sound and best durability available. They swivel up to 90 degrees so they can double as a makeshift set of speakers. Monoprice BT-400 Bluetooth Over Ear Headphone with Qualcomm AptX Support. They feature the Qualcomm aptX audio codec, for superior audio quality when streaming from an aptX-enabled device. These sport earphones feature an IPx4 Ingress Protection rating, which means that they won't be harmed or otherwise fail due to limited moisture exposure, such as that of splashing water, sweat, or light rain. Enjoy up to 4 hours of wireless Bluetooth audio streaming with the superior, noise-free, sonic clarity of the advanced Qualcomm aptX; audio codec. Form customer ear clips using the memory wire at the end of each lead, to ensure that the earphones stay in your ears, where they belong. Monoprice Monolith M1060 Over-Ear Open-Back Planar-Magnetic Headphones w/case. Condition is Used. Shipped with USPS Priority Mail Large Flat Rate Box. Headphone backs still have plastic protective material on them. Gold Plated Pins, extra audio cable included. Our apologies, and We will try to make it right for you. High sound quality, comfortable ergonomic design with build in volume control. high quality headphones at a good price. No software are included with any systems. These in-ear earphones feature sound quality that rivals that of over-the-ear headphones costing hundreds of dollars. The unique design inverts the driver orientation so that the sound reflects, reverberates, and builds body within the aluminum shell. This produces a flatter frequency response, with a stronger bass response and cleaner mids and highs than conventional designs using the same materials, as shown in the chart above. Large-Driver Bluetooth Earphones These earphones feature a wireless Bluetooth connection, which allows you to listen to music without being tethered to your phone or mp3 player. A built-in microphone allows you to safely make and receive phone calls without having to manipulate or hold your phone. The built-in rechargeable battery provides up to 5 hours of continuous playback or phone usage time. Features: • Bluetooth v4. 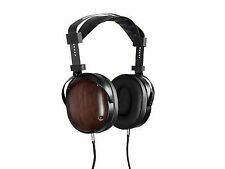 Monoprice Monolith M560 Planar Headphones 16051 560-MB2. Condition is Used. Shipped with USPS Priority Mail.